BERLIN, JUNE 2, 2016 — The resolution on the Armenian Genocide, long awaited by the Armenian community especially in the diaspora, and long-feared by the Turkish establishment, is set to be put to a vote on June 2. As the Mirror-Spectator goes to press before that date, it is impossible to predict here how the proceedings will unfold and what they will yield. What is possible, however, is to present the content of the resolution, based on a draft proposal leaked to the press a few days before — a draft which as such is subject to changes in the course of the actual debate — and to sketch the parameters of the political debate it has unleashed. The unified text agreed upon by the parliamentary factions of the Christian Democratic Union/Christian Social Union (CDU/CSU), Social Democratic Party (SPD) and Green Party, is entitled, “Remembering and Commemorating the Genocide against the Armenians and other Christian Minorities in 1915 and 1916.” In a series of premises, the Bundestag presents its position before listing demands it makes on the government. – in the spirit of the German Bundestag debate on April 25, 2015 on the centenary that it continue to contribute to a vast public discussion of the expulsions and near-extermination of the Armenians in 1915/16, as well as the role of the German Empire. The emphasis in the demands is on promoting study and reappraisal of the past, seeking reconciliation and providing the means (scholarships, programs, financial aid etc.) to make this possible. From the Turkish standpoint, the resolution was illegitimate, riddled with falsehoods and constituted political poison, and therefore had to be stopped. On May 28, it was reported that a motley collection of Turkish groups, otherwise divided among themselves, had come together to sign email letters to members of the Bundestag protesting the resolution. Over 500 organizations are estimated to have joined this initiative under the leadership of the Turkish Community in Berlin, from members of the AKP, and CHP, to rightwing Grey Wolves, Islamists and Kemalists. (There was even mention of something called the “Talaat Pasha Committee.) Their message to the Bundestag, according to press reports, was: “Over 90 percent of the Turkish population rightly rejects the accusation of genocide, and considers it slander.” They continued with the warning that any resolution would be “poison for the peaceful coexistence between Germans and Turks here, as well as in Turkey.” Their reference to 30,000 Germans living in the Antalya region could be read as a not-so-veiled threat. Although the mailing reportedly went to all parliamentarians, those of Turkish background or who have ethnic Turks among their voters were particularly targeted. The same day, an estimated 1,300 demonstrators from this milieu took to the streets in Berlin, with signs saying “parliaments are not courtrooms,” and “the Bundestag is not competent” (i.e. does not have jurisdiction over such matters). 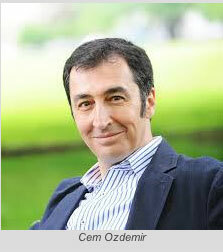 Foremost among the parliamentarians to be attacked by this coalition was Cem Özdemir, the Green Party leader who has led the Genocide resolution initiative. As he told the press, he had been called every imaginable name: “It’s always the same terms,” he said: “Traitor, Armenian pig, S.O.B., Armenian terrorist, even Nazi.” He remarked that the situation for parliamentarians in Germany, however, differs from that in Turkey. “No Bundestag member should fear being jailed or even killed,” he said. If the draft resolution provoked rage and protests from Turkish quarters, it also raised serious questions from those who — Armenians or not — supported political action to condemn the genocide officially. One point singled out for criticism was the absence of any reference in the text to the Greek Orthodox, who should be included among the victims of the genocide. The most important criticism dealt with the way the text deals with the issue of genocide per se. Three leading public figures who are proponents of genocide recognition, sent an open letter on May 30 to the members of the Bundestag. They are Helmut Donat-Freiherr von Bothmer, whose Donat publishing company was a pioneer in issuing works on the Armenian Genocide; Steffen Reiche, former Bundestag member and parish priest; and Prof. Wolfgang Schlott, President of the Exile-PEN in German-speaking countries. The case they argue reflects the thinking of a significant segment of German civil society engaged in the Armenian issue. Expressing concern that the lawmakers “are making a serious, irreparable mistake” in the draft, they write that the June 2 decision will carry consequences of political and historical nature, as well as in relation to international law. They assert that since 1915 the full truth about the Genocide has been “repressed, denied or at best ignored” by a succession of ruling bodies in Germany and that to recognize the Genocide means taking this into account. Instead, they state, aside from its title, the text deals with genocide only indirectly. They criticize the formulation which refers to the destiny of the Armenians as “exemplary for the history of mass murders, ethnic cleansing, expulsions, yes Genocide, which characterized the 20th century in such a terrible way,” saying it is “inappropriate and unacceptable” in the context of a century of silence on the issue. They criticize the fact that further references to genocide in the text are attributed to “numerous independent historians” or to speeches by parliamentarians and Gauck. The open letter includes a critique by Berlin genocide expert Prof. Tessa Hofmann, who reviews the German role in 20th genocides, from the Herreros and Nama in Namibia, to the Jews, Sinti and Roma in World War II; in the interim period, she writes, Imperial Germany was co-responsible for the Ottoman war crimes on Christians between 1914 and 1918. She attacks the repeated formulations “massacre” and “expulsions” which play down the fact that the deportations were in fact death marches. She also calls for stronger wording to include the Greek Orthodox victims. Mooting that the parliamentarians would never formulate a resolution on the Holocaust in such euphemistic terms, the authors of the open letter demand adequate, precise language. They underline the fact that “in evaluating the resolution draft, it is not a matter of hair-splitting, but of genocide – the most heinous crime in the history of mankind. And if the Bundestag takes a position on this, it must be unambiguous.” By the same token, they demand that the ignominious role of Imperial Germany’s role be clearly named and denounced. A more detailed analysis of the genocide debate in Germany will be possible after the vote has been taken. One key aspect to be examined – and which the authors of the open letter reference — is the extent to which the entire issue has become a political football in the Realpolitiking world of relations with Turkey, then and now.